Bring charcoal into play and keep your suiting options open. 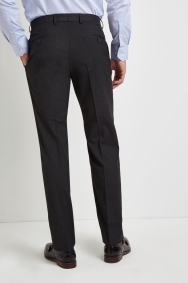 A great alternative to classic black, these bestselling charcoal trousers from Moss Esq. will help give your workwear collection a new lease of life. Being regular fit you’ll find there’s plenty of room through the waist and leg, while the use of machine-washable stretch fabric ensures all-day comfort and minimum fuss. Move from your desk to the bar without breaking stride. Team with a sky blue shirt, a business tie and a pair of black monk shoes for a no-nonsense office look. Excellent fit, quality and price. A good product for the casual application, not a perfect fit which is my problem, I realy needed a size 37 waste not 38. My partner has not worn the trousers yet but likes the way they fit and is very pleased with them. I normally have no trouble with a 34 waist and as the trousers I ordered had stretch I was confident they would be ok, but they were tight and had no stretch in waist band at all. Very disappointed. 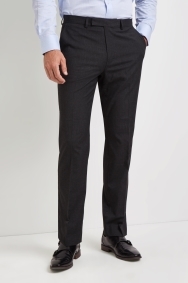 These trousers are very good quality and I like that they have a little give. I think that they might be a little longer than expected based on my last Moss bros trousers of the same leg length. Apart from that they are perfect. The quality is not as good as previous purchases.